Russia vs. Ukraine for Crimea? 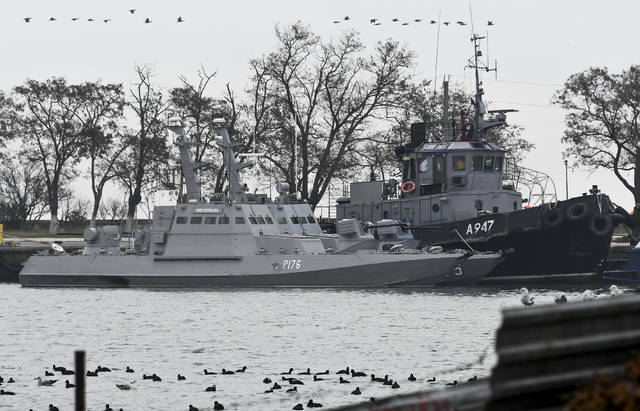 MOSCOW (AP) — Ukraine’s president demanded Monday that Russia immediately release Ukrainian sailors and vessels seized in a standoff around Crimea that sharply escalated tensions between the two countries and drew international concern. The two neighbors have been locked in a tense tug-of-war since Russia’s 2014 annexation of Crimea, but the incident late Sunday, in which Russian coast guard ships fired on Ukrainian navy vessels near the Kerch Strait, directly pitted the two militaries against each other, placing them on the verge of an open conflict. The Ukrainian navy said six of its seamen were wounded when Russian coast guards opened fire on three Ukrainian ships near the Kerch Strait and then seized them. Russia said that three Ukrainian sailors were lightly injured and given medical assistance. Ukraine’s president, Petro Poroshenko, chaired an emergency meeting of his Cabinet early Monday and asked parliament to introduce martial law for two months in response to what he described as Russian aggression. The fate of the Ukrainian seamen was not immediately clear. Klimkin insisted that they should be treated as prisoners of war while Kremlin spokesman Dmitry Peskov did not say what legal status they have. An emergency meeting of the United Nations Security Council was also called for Monday. The European Union and NATO called for restraint from both sides. Poroshenko had a phone call Monday with NATO Secretary-General Jens Stoltenberg to discuss the situation. NATO later said that at Poroshenko’s request, its ambassadors and Ukraine’s envoy will hold emergency talks in Brussels later Monday. Poroshenko said at a meeting of Ukraine’s national security council Monday that “we demand that (the ships and crews) are urgently turned over to the Ukrainian side” and called for a “de-escalation” of the crisis around Crimea. 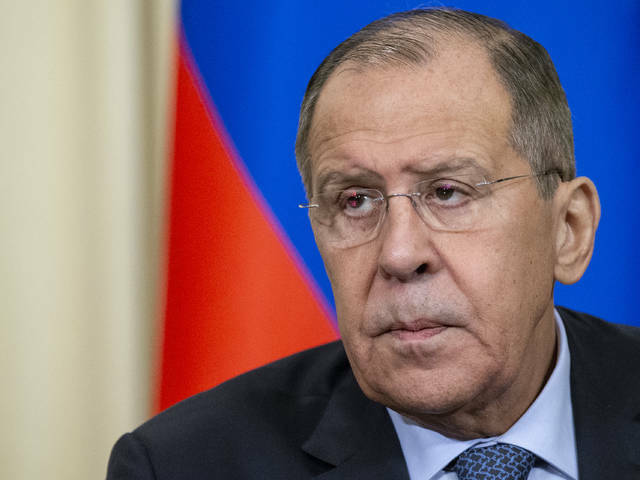 Russia and Ukraine have traded blame over the incident that further escalated tensions that have soared since Russia annexed Ukraine’s Crimean Peninsula in 2014 and backed a separatist insurgency in eastern Ukraine with clandestine dispatches of troops and weapons. 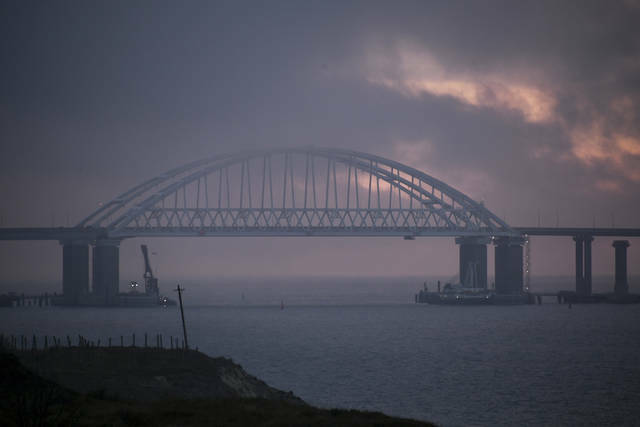 Ukraine said its vessels were heading to the Sea of Azov in line with international maritime rules, while Russia charged that they had failed to obtain permission to pass through the Kerch Strait separating Crimea from the Russian mainland. The narrow strait is the only passage between the Black Sea and the Sea of Azov. It’s spanned by a 19-kilometer (11.8-mile) bridge that Russia completed this year. While a 2003 treaty designates the Kerch Strait and Sea of Azov as shared territorial waters, Russia has sought to assert greater control over the passage since the annexation of Crimea. He urged the West to “calm down those in Ukraine who are trying to unleash a military hysteria to get political gains in connection with the planned elections” — a reference to Ukraine’s presidential vote in March. A motion to introduce martial law requires a simple majority of votes in the 450-seat parliament, which Poroshenko’s party controls. If martial law is introduced as proposed for 60 days, it will derail the presidential election campaign, which was expected to start on Dec. 30 with the vote in March. Some lawmakers lashed out at Poroshenko’s move as an attempt to influence the vote. Polls show Poroshenko trailing far behind arch-rival Yulia Tymoshenko. “Martial law in Ukraine would present a wonderful chance to manipulate the presidential elections,” said Oksana Syroid, a deputy speaker of parliament who is a member of the Samopomich faction. She noted that martial law was not introduced in 2014 or 2015 despite large-scale fighting between Ukrainian forces and Russia-backed separatists in the east. “We believe that it’s wrong and dangerous to solve electoral tasks by waving a flag of war,” he said. Yuras Karmanau in Minsk, Belarus, and Nataliya Vasilyeva in Moscow contributed to this report. DAMASCUS, Syria (AP) — Russian warplanes attacked rebel-held areas in northern Syria for the first time in weeks on Sunday, as Syrian officials said more than 100 people were treated at hospitals for a suspected poison gas attack in the northern city of Aleppo that Damascus and Moscow blamed on rebels. The rebels, who have denied carrying out any poison gas attacks, accused the government of trying to undermine a truce reached by Russia and Turkey in September during a summit in the Russian city of Sochi. The targeted area is rebel-held and home to extremist groups opposed to the truce such as the al-Qaida-linked Horas al-Din, which has described the deal as a “great conspiracy,” and the Ansar al-Din Front. The latest wave of shelling and airstrikes in northern Syria is the most serious violation of a truce reached by Russia and Turkey that brought relative calm to the country’s north for the past two months. “The planes of Russia’s Aerospace Defense Forces carried out strikes on the detected artillery positions of terrorists in the area, from where the shelling of Aleppo civilians with chemical munitions was conducted late” Saturday, Konashenkov said. SANA said the alleged chemical attack late Saturday was carried out by “terrorist groups positioned in Aleppo countryside” that fired shells containing toxic gases on three neighborhoods in Syria’s largest city. Human Rights Watch’s Deputy Director for the Middle East and North Africa Lama Fakih said “serious reports of suspected chemical weapon attacks should not be left without investigation.” She added that all parties, including the Syrian government and Russia, should facilitate an investigation by the Organization for the Prohibition of Chemical Weapons into the suspected attack in Aleppo. “According to preliminary data, particularly the symptoms shown by the victims, the shells that bombarded residential areas of Aleppo were filled with chlorine gas,” Konashenkov said. Syria’s forensic medicine general director, Zaher Hajo, told The Associated Press that all but 15 of the 105 people who were treated have been discharged. He said two people who were in critical condition have improved. A joint team from the United Nations and the Organization for the Prohibition of Chemical Weapons accused Syria’s government of using chlorine gas in at least two attacks in 2014 and 2015, and the nerve agent sarin in an attack in April 2017 in the town of Khan Sheikhoun that killed about 100 people. The UN-OPCW team also accused the Islamic State extremist group of using mustard gas twice, in 2015 and 2016. In Jordan, local media reported that troops opened fire on six people trying to infiltrate the border from Syria killing four and wounding two. THE HAGUE, Netherlands (AP) — The global chemical weapons watchdog is considering sending inspectors to investigate an alleged poison gas attack by rebels in Syria that wounded dozens, its director-general said Monday. Syria’s state-run SANA news agency said the suspected chemical attack late Saturday was carried out by “terrorist groups positioned in Aleppo countryside” that fired shells containing toxic gases on three neighborhoods in Syria’s largest city. Syria has asked the Organization for the Prohibition of Chemical Weapons to launch an investigation and officials at the Hague-based watchdog have been in touch with U.N. experts “to assess the security situation on the ground for a possible deployment” of a fact-finding mission, Director-General Fernando Arias told a meeting of the organization’s member states in The Hague. Arias said that different sources put the number of wounded at between 50 and 100. The OPCW’s fact-finding mission is tasked with investigating alleged chemical attacks in Syria and reporting back to the organization and the United Nations. It has probed several attacks in Syria blamed on both government forces and rebels. The OPCW also has recently been empowered — against the wishes of Syria and its ally Russia — to apportion blame for chemical attacks. “The OPCW experts will continue to work independently to verify all allegations of use of chemicals as weapons in the territory of the Syrian Arab Republic,” Arias said. Following the alleged attack, Russian warplanes attacked rebel-held areas in northern Syria for the first time in weeks on Sunday. The rebels, who deny carrying out any poison gas attacks, accused the government of trying to undermine a truce reached by Russia and Turkey in September. Russian military spokesman Maj. Gen. Igor Konashenkov said Sunday that Russian warplanes destroyed militant positions in northern Syria linked to the alleged gas attack. The announcement in the Hague came shortly before President Bashar Assad reshuffled his Cabinet, replacing nine officials including the minister in charge of internal security. Cabinet reshuffles like the one announced Monday are not uncommon in Syria and have occurred on several occasions since the civil war began seven years ago. It was not immediately why Assad replaced longtime Interior Minister Mohammed Ibrahim al-Shaar, who was wounded in a 2012 bombing that killed four top security officials. Al-Shaar was replaced by Maj. Gen. Mohammed Khaled Rahmoun, who headed the powerful Political Security Directorate, one of the main intelligence agencies in the country. The U.S. Department of Treasury imposed sanctions on Rahmoun, 61, last year. Other ministers changed include those of tourism, education, public works, telecommunications and industry. In eastern Syria, meanwhile, four days of fighting between U.S.-backed forces and Islamic State militants have left scores dead on both sides, opposition activists said. The latest round of fighting broke out Friday when IS took advantage of fog to launch an offensive from the last area they control in Syria. The Britain-based Syrian Observatory for Human Rights said 92 members of the Kurdish-led Syrian Democratic Forces and 61 militants have been killed since. Omar Abou Leila, who monitors the war in Deir el-Zour from Europe, said Monday that dozens of SDF fighters were killed. SDF fighters launched an offensive on Sept. 10 under the cover of airstrikes by the U.S.-led coalition to liberate the last pocket held by IS near the Iraqi border. They have made little progress since then. Associated Press writers Bassem Mroue in Beirut and Albert Aji in Damascus, Syria contributed. This is the time of the year when home safety experts warn us the danger of fire goes up. Colder weather means heating equipment shut off for months is put back in service. The Christmas season means some of us go all-out in decorating, sometimes overloading circuits and wires with hundreds, even thousands of decorative lights. And, let’s be honest, some people are experimenting with cooking techniques that result in burning more than just the food. What if, despite all our precautions, fire breaks out in our homes? Will we and our loved ones be able to get out safely? Our chances of escaping a fire are increased exponentially if we are alerted to it quickly. Hundreds of people each year die of smoke inhalation or because they are trapped by flames. Smoke, heat and carbon dioxide/carbon monoxide detectors can give us the head start we need to survive fires in our homes. Get one or more. Ensure they are in good operating condition. It could save your life. Let’s be clear: The horrific killing eight days ago of Aisha Fraser Mason, allegedly at the hands of her estranged husband, Lance Mason, a former Cuyahoga County Common Pleas Court judge, was not caused by the administration of Cleveland Mayor Frank Jackson giving Mason a job after he got out of prison. Rather, this tragedy is a morality tale about what-ifs: What if those with political connections hadn’t intervened to try to help Mason get out of prison early? What if the courts made it more of a priority to protect survivors of domestic violence? Convicted violent felons — especially in domestic violence cases — must be subject upon release from prison to sufficient controls and supervision that they cannot easily perpetrate further harm to their victims, and they must be required to continue with regular anger management and counseling programs. Of course, a determined perpetrator will often find a way to do harm. But it must be made as hard as possible. And friends of a seemingly nice guy (or nice gal) do him or her no favors by seeking to short-circuit the redemptive process of credible prosecution and sentences in keeping with the crime. Despite rate increase after rate increase over the past several years, sending a letter across the country at a cost of two quarters still qualifies as a bargain. Especially when neither rain nor sleet nor gloom of night keeps postal carriers from completing their appointed rounds. That 50-cent cost and other delivery charges paid by postal customers large (such as Amazon) and small bring in enough revenue to cover current USPS expenses. The postal service’s long-term expenses — particularly retiree benefits — are another matter, however, and because of government-dictated accounting, recent financial statements show the postal service lost about $2.7 billion in 2017, and its unfunded liabilities are approaching $125 billion. So knowing that branch closings — carried out by the hundreds nationwide in recent years to help improve the bottom line — always loom, we find ourselves less concerned where a branch is located than whether one exists at all. With the issues facing the U.S. Postal Service today, an open branch, wherever it’s located, is reason to be thankful. Send a card. By mail. In 2014, Ohio Attorney General Mike DeWine, now the governor-elect, took over an investigation of the Put-In-Bay Police Department, but he accomplished little. Nobody went to prison; nothing of significance changed. Now the village government, as a whole, has been under investigation by DeWine for almost two years now, with no resolution. Village Mayor Bernard “Mac” McCann was indicted on a felony charge for having an unlawful interest in a village contract. It’s a legitimate concern that there might be a connection between a possibly corrupt police department, and the alleged corruption of others in the government that still is not fully known. It’s difficult to comprehend how much damage police caused — just from the instances that are known. Karl Goss suffered brain injuries during a Labor Day brawl in 2016. He was permanently disabled and was on a ventilator until his death earlier this month. “What happened to the family is unthinkable. You would not wish this upon your worst enemy,” said Cleveland attorney Jordan Lebovitz, who represents Goss’ family in what is now a wrongful death lawsuit. We hope the truth comes out when the Goss’ lawsuit goes to trial next year, and we hope Mike DeWine does a better job addressing corruption in the future than he’s done in the past. Columbus – Provisional statistics released today show this Thanksgiving holiday travel season was the safest since 1991. During the five-day reporting period, from Wednesday, November 21, at 12 a.m. until Sunday, November 25, at 11:59 p.m., six people were killed in six fatal crashes. A statistical analysis of the Patrol’s enforcement activity over the holiday is available at https://www.statepatrol.ohio.gov/doc/Thanksgiving2018.pdf. On November 19, at 12:19 p.m., troopers stopped a 2017 Penske truck with Indiana registration for a speed violation on Interstate 70. Criminal indicators were observed and a Patrol drug-sniffing canine alerted to the vehicle. A probable cause search revealed the contraband. The driver, Benjamin Malugani, 23, from Willits, Calif., was incarcerated in the Tri-County Jail and charged with possession of marijuana, a second-degree felony. If convicted, he could face up to eight years in prison and up to a $15,000 fine.